When we started HelloFresh from Patrick’s living room a few short years ago, we wanted to make dinner time easy. 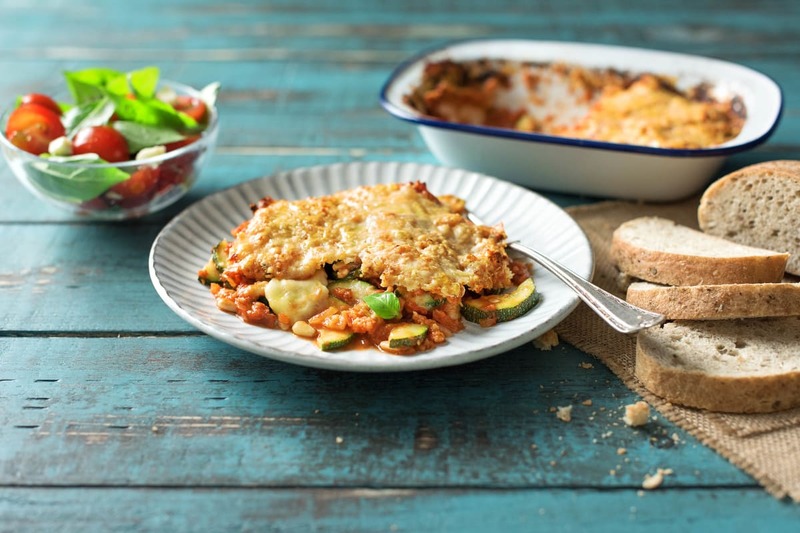 Whilst the emphasis has always been on quick and tasty, there are certain recipes that deserve a bit more time and this parmigiana is one of them. We recommend enlisting a sous chef to assist you with the prep. They’ll be more than happy to help once they smell what’s on the menu! Pre-heat your oven to 220 degrees. Peel and finely chop the red onion and the garlic. 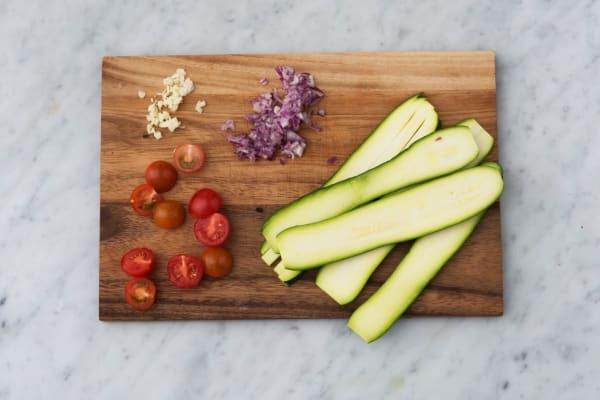 Slice the courgette lengthways into ½cm strips. Chop the cherry tomatoes in half. Next cut three-quarters of your mozzarella into slices, as thin as you can (keep a quarter for your salad). Press kitchen paper or a clean tea towel onto each slice to soak up as much excess moisture as possible. Add a splash of olive oil to a pan and fry your red onion and garlic on medium-low heat for around 5 mins, or until soft. Tip: You can start step 5 at the same time to save some time. Add in the tomato passata with a pinch of salt, the oregano and a few grinds of black pepper. Bubble the mixture for 5 mins, then remove from the heat to cool down. Heat a splash of olive oil in a large frying pan on high heat. 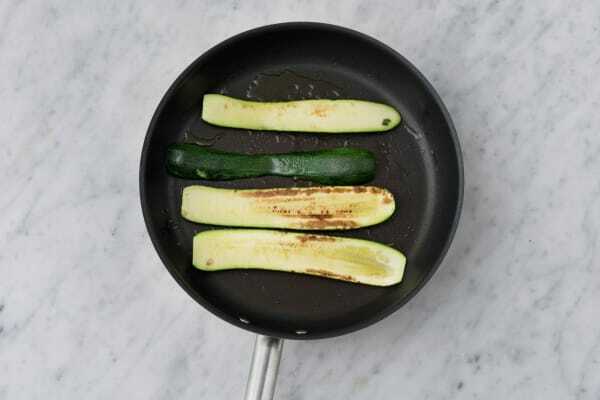 Once hot, fry your courgette strips in batches. Cook them for 1 minute on each side and then keep to the side. Do not overcrowd the pan as this will stew the courgette rather than brown it. 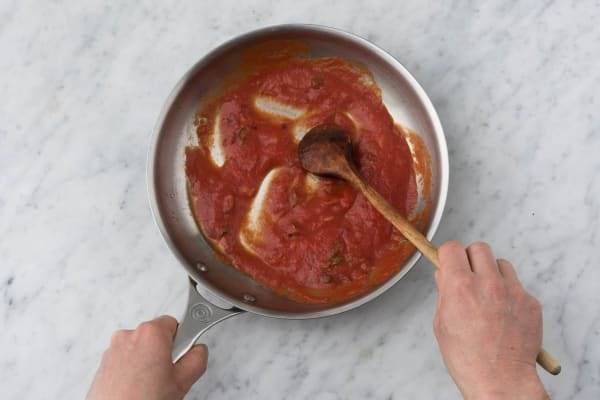 Put enough (about a third) of your passata in an ovenproof dish to thinly cover the bottom. Top this with a layer of your courgette (you should use roughly half your courgette here as you’re going to repeat this step!). Next, layer on a couple of slices of mozzarella, followed by some torn basil and half of the pine nuts. Spread on another layer of passata, followed by your remaining courgette, a couple more slices of mozzarella and bit more basil (save some of each for your salad) and the rest of your pine nuts. Finally add one more layer of passata and top your parmigiana with the hard cheese and the breadcrumbs. Bake in your oven for 15 mins. Tear up a small handful of basil leaves and the remaining mozzarella. Toss these and your cherry tomatoes in a bowl with a drizzle of olive oil and a pinch of salt and pepper. Serve your parmigiana with your salad and foccacia on the side.